FULLY REMODELED OCEAN-VIEW HOME! Everything new inside and out. Casa Diego is a beautiful home found along Sandy Beach in Rocky Point. This particular home has 4 bedrooms and two bathrooms, which can accommodate up to 8 guests very comfortably. The living room of this beautiful home has three large and very plush red leather sofas, a rectangular shaped glass top coffee table, tile rimmed fireplace and a built in TV and DVD unit above the fireplace. There are windows all the way around, which allow you to view the ocean and feel the cool breeze when you leave the doors open. 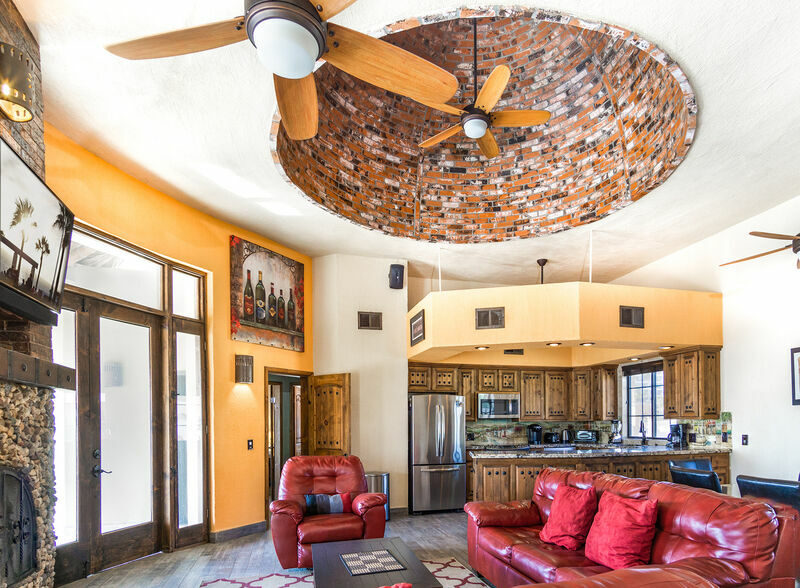 Very high ceilings with a recessed red brick tiled dome bring real drama to this beach home. The kitchen has white ceramic tiled counter tops with a built in bar and bar stools. The cabinets and appliances are bright white and there is recessed can lighting and decorated plant shelves. You will also appreciate the coffee maker, blender, and toaster. The dining room has a whitewash rectangular shaped table with four chairs and a beautiful fruit basket centerpiece. The dining room also has a low profile buffet stand, which has a stereo system on top so you can jam out to your favorite tunes. The first bedroom has a Queen size beds with striped colored bedspread. There is one guest bedroom that has two twin size beds with orange, pink and baby blue checkered bedding. This room includes a bedside table with a lamp and a wall mounted art piece above the beds. The room comes with a view window and two large double door closets with a built in dresser where you can store your clothing. The hall bathroom has a walk in shower with a single sink vanity, mirror and commode. The next guest bedroom has a queen size bed with checkered orange and green bedding, a built in bookshelf, built in dresser with six drawers and a double door closet. The 3rd guest bedroom has a set of twin size beds this time with blue and green checkered bedding. The room includes a nightstand with a lamp, a built in 6 drawer dresser and two double door closets surrounding a view window. The front yard has outdoor seating so that you can dine outside after cooking up some fresh fish on the BBQ. You can watch the sunset over the Sea of Cortez and you are just a short walk away from the sand and the surf. Sip a cocktail and feel that warm ocean breeze against your skin. The home has cold AC and ceiling fans throughout. You should organize a family trip and come see what Rocky Point is all about. You will not be disappointed with this wonderful Sandy Beach home. You should check now for rates and availability. NO PETS. Bring your own towels. GARAGE IS NOT AVAILABLE. The pool is now open but is not heated. The Jacuzzi is available. 07/28/13 09:23pm Michael Place was great.We look forward to going back again soon. 06/18/17 10:52pm Eric Very beautiful home. Had a wonderful weekend, thank you seaside!! 06/13/16 03:20pm Daniel Very nice house. It is perfect for a two family vacation with the split floor plan. 03/28/16 12:11am Linda Had a little problem with the condo but Ernesto, your manager for seaside managed the situation thank you 👍🏻 kudos to him.